Ginda, Michael, Naren Suri, Andreas Bückle, and Katy Börner. "Empowering Instructors in Learning Management Systems: Interactive Heat Map Analytics Dashboard". Illinois Indiana ASEE Section Conference. Abello, James, Katy Börner, Russ Caflisch, Tina Eliassi-Rad, Jianbo Gao, Lev Manovitch, Vwani Roychowdhury, and Timothy Tangherlini. "Culture Analytics". TBD. Börner, Katy, and Andreas Bueckle. 2019. "Data visualization literacy: Definitions, conceptual frameworks, exercises, and assessments". PNAS 116 (6): 1857-1864. doi: 10.1073/pnas.1807180116. 2019. "Network Visualization in the Humanities (Dagstuhl Seminar 18482)". Dagstuhl Reports 8 (11): 139-153. doi: 10.4230/DagRep.8.11.139. Zoss, Angela, Adam V. Maltese, Stephen Miles Uzzo, and Katy Börner. 2018. "Network visualization literacy: Novel approaches to measurement and instruction". In Network Science in Education. Springer. Wojton, Mary Ann, Donnelley Hayde, Joe E. Heimlich, and Katy Börner. 2018. "Begin at the Beginning: A Constructionist Model for Interpreting Data Visualizations". Curator: The Museum Journal 61 (4): 559-574. Börner, Katy, Adam Simpson, Andreas Bueckle, and Robert Goldstone. 2018. "Science Map Metaphors: A Comparison of Network Versus Hexmap-Based Visualizations". Scientometrics 114 (2): 409-426. Azoulay, Pierre, Joshua Graff-Zivin, Brian Uzzi, Dashun Wang, Heidi Williams, James Evans, Ginger Zhe Jin, Susan Feng Lu, Benjamin F. Jones, Katy Börner, Karim R. Lakhani, Kevin J. Boudreau, and Eva C. Guinan. 2018. "Toward a More Scientific Science". Science 361 (6408): 1194-1197. Börner, Katy, William Rouse, Paul Trunfio, and H. Eugene Stanley. 2018. "Forecasting Innovations in Science, Technology, and Education". PNAS 115 (50): 12573-12581. doi: 10.1073/pnas.1818750115. Staudt, Joseph, Huifeng Yu, Robert Light, Gerald Marschke, Katy Börner, and Bruce Weinberg. 2018. "High-impact and transformative science (HITS) metrics: Definition, exemplification, and comparison". PLoS ONE 13 (7): e0200597. Zoss, Angela. 2018. "Network Visualization Literacy: Task, Context, and Layout". Thesis, Doctor of Philosophy: Katy Börner, Johan Bollen, Hamid R. Ekbia, Staša Milojević. Indiana University, Bloomington, IN. Börner, Katy, Olga Scrivner, Michael Gallant, Shutian Ma, Xiaozhong Liu, Keith Chewning, Lingfei Wu, and James Evans. 2018. "Skill Discrepancies Between Research, Education, and Jobs Reveal the Critical Need to Supply Soft Skills for the Data Economy". PNAS 115 (50): 12630-12637. doi: 10.1073/pnas.1804247115. Shiffrin, Richard M., Katy Börner, and Steven M Stigler. 2018. "Scientific Progress Despite Irreproducibility: A Seeming Paradox". PNAS 115 (11): 2632-2639. doi: 10.1073/pnas.1711786114. Fortunato, Santo, Carl T. Bergstrom, Katy Börner, James Evans, Dirk Helbing, Stasa Milojevic, Alexander Petersen, Filippo Radicchi, Roberta Sinatra, Brian Uzzi, Alessandro Vespignani, Ludo Waltman, Dashun Wang, and Albert-László Barabási. 2018. "Science of Science". Science 359 (6379). Scrivner, Olga, Gagandeep Singh, Sara Bouchard, Scott Hutcheson, Ben Fulton, Matt Link, and Katy Börner. 2018. "XD Metrics on Demand Value analytics: Visualizing the impact of internal information Technology investments on external Funding, Publications, and collaboration networks". Frontiers Research Metrics and Analytics 2 (10). Ploszaj, Adam, Xiaoran Yan, and Katy Börner. 2018. "The Impact of Air Transport Availability on Research Collaboration: A Case Study of Four Universities". arXiv:1811.02106. Börner, Katy, Craig Alan Stewart, Valentin Pentchev, David Hancock, and Jeremy Fischer. 2017. "Jetstream: Network Workbench and Custom VMs for Network Scientists on the Science Cloud". NetSci 2017, Indianapolis, IN. Snyder, Steve, Katy Börner, Gagandeep Singh, Sara Bouchard, Adam Simpson, Gerhard Klimeck, Michael Zentner, and Steve Snyder. 2017. "Engineering Research Center Observatory". ERC Biennial Conference. Yao, Xiaohui, Jingwen Yan, Kwangsik Nho, Shannon Risacher, Katy Börner, Andrew Saykin, and Li Shen. 2017. "Genetic Findings Using ADNI Multimodal Quantitative Phenotypes: A 2016 Update". Alzheimer's & Dementia 13 (7): P694-P695. Börner, Katy, Craig Alan Stewart, Ben Fulton, Steven Gallo, Matt Link, Robert Henschel, Tom Yearke, Robert L. Deleon, and Thomas Furlani. 2017. "Value Analytics: A Financial Module for the Open XDMoD Project". PEARC17, New Orleans, LA 6. Börner, Katy, Naren Suri, Nan Li, Zhen Gao, Tian Xia, and Xiaozhong Liu. 2017. "Enter a Job, Get Course Recommendations". iConference, Wuhan, China 5. Yao, Xiaohui, Jingwen Yan, Michael Ginda, Katy Börner, Andrew Saykin, and Li Shen. 2017. "Mapping Longitudinal Scientific Progress, Collaboration and Impact of the Alzheimer’s Disease Neuroimaging Initiative". PLoS ONE e0186095. doi: 10.1371/journal.pone.0186095. Börner, Katy, and Lisel Record. 2017. "Macroscopes for Exploring, Navigating, and Managing Science and Technology". #Nodes 56-59. Börner, Katy, Andreas Bueckle, Philip Beesley, and Matthew Spremulli. 2017. "Lifting the Veil". Future Technologies Conference (FTC) | Vancouver, Canada. Emmons, Scott, Robert Light, and Katy Börner. 2017. "MOOC Visual Analytics: Empowering Students, Teachers, Researchers, and Platform Developers of Massively Open Online Courses". Journal of the Association for Information Science and Technology (JASIST) 68 (10): 2350-2363. Murdock, Jaimie, Colin Allen, Katy Börner, Robert Light, Simon McCalister, Andrew Ravenscroft, Robert Rose, Doori Rose, Jun Otsuka, David Bourget, John Lawrence, and Chris Reed. 2017. "Multi-Level Computational Methods for Interdisciplinary Research In the HathiTrust Digital Library". PLoS ONE 12 (9): e0184188. doi: 10.1371/journal.pone.0184188. Carpenter, Janet S., Tei Laine, Blake Harrison, Meghan LePage, Nathan Hoteling, and Katy Börner. 2017. "Topical, Geospatial, and Temporal Diffusion of the 2015 North American Menopause Society Position Statement on Non-hormonal Management of Vasomotor Symptoms". Menopause: Journal of the North American Menopause Society 24 (10): 1154-1159. Knepper, Richard. 2017. "Shifting Modalities of Use in the XSEDE Project". Thesis, Doctor of Philosophy in Informatics: Nathan Ensmenger (Chair), Christena Nippert-Eng, Katy Börner, Kosali Simon. Indiana University, Bloomington, IN. Börner, Katy, Chin Hua Kong, Una O Osili, Robert Light, and Jacqueline Ackerman. 2017. "Philanthro-Metrics: Mining Multi-Million-Dollar Gifts". PLoS ONE 12 (5): e0176738. doi: 10.1371/journal.pone.0176738. Börner, Katy, Valentin Pentchev, Matthew Hutchinson, James Pringle, Jason Rollins, Yadu N. Babuji, and Eamon Duede. 2017. "Web of Science™ as a Research Dataset". 16th International Conference on Scientometrics and Informetrics, Wuhan, China. Ginda, Michael, Andrea Scharnhorst, and Katy Börner. 2016. "Modelling the Structure and Dynamics of Science Using Books". In Theories of Informetrics: A Festschrift in Honor of Blaise Cronin, edited by Sugimoto, Cassidy, 304-334. Munich: De Gruyter Saur. Börner, Katy, and Andreas Bueckle. 2016. "Visualizing Living Architecture: Augmented Reality Visualizations of Sensors, Actuators, and Signal Flows ". In White Papers, edited by Beesley, Philip, and Ala Roushan, 109-112. Toronto: Riverside Architectural Press. Börner, Katy, and Stasa Milojevic. 2016. "Modelling Science, Technology, and Innovation". OECD Blue Sky III, Ghent, Belgium. Staudt, Joseph, Huifeng Yu, Robert Light, Gerald Marschke, Katy Börner, and Bruce Weinberg. 2016. "High-Impact and Transformative Science (HITS) Metrics". OECD Blue Sky III, Ghent, Belgium. Börner, Katy, Bruce Edmonds, Stasa Milojevic, and Andrea Scharnhorst, eds. 2016. "Simulating the Processes of Science, Technology, and Innovation". Scientometrics 110 (1): 385–385. Bollen, Johan, David Crandall, Damion Junk, Ying Ding, and Katy Börner. 2016. "An Efficient System to Fund Science: From Proposal Review to Peer-to-Peer Distributions". Scientometrics 110 (1): 521-528. Börner, Katy, Bruce Edmonds, Stasa Milojevic, and Andrea Scharnhorst. 2016. "Editorial". Scientometrics 10 (1): 387–390. Emmons, Scott, Stephen Kobourov, Michael Gallant, and Katy Börner. 2016. "Analysis of Network Clustering Algorithms and Cluster Quality Metrics at Scale". PLoS ONE 11 (7): e0159161. doi: 10.1371/journal.pone.0159161. Gilsenan, Mary B., Fabrizio Abbinante, O'Dea Eileen, Ana Canals, and Angelika Tritscher. 2016. "Open Risk Assessment: Data". EFSA Journal 14 (S1). Börner, Katy, Joe E. Heimlich, Russell Balliet, and Adam V. Maltese. 2016. "Investigating Aspects of Data Visualization Literacy Using 20 Information Visualizations and 273 Science Museum Visitors". Information Visualization 15 (3): 198-213. Knepper, Richard, and Katy Börner. 2016. "Comparing the Consumption of CPU Hours with Scientific Output for the Extreme Science and Engineering Discovery Environment (XSEDE)". PLoS ONE 11 (6): e0157628. doi: 10.1371/journal.pone.0157628. Lyons, Elizabeth, E. William Colglazier, Caroline Wagner, Katy Börner, David Dooley, C. Dan Mote, and Mihail C. Roco. 2016. "How Collaborating in International Science Helps America". Science & Diplomacy 5 (2). Börner, Katy. 2016. "Data-Driven Science Policy". Issues in Science and Technology 33 (3): 26-28. Jibu, Mari, Gregory O'Hare, and Katy Börner. 2015. "Knowledge Flows and Delays in the Pharmaceutical Innovation System". 15th International Conference on Scientometrics and Informetrics, Istanbul, Turkey 877-878. Patel, Kishor, Sergio Govoni, Ashwini Athavale, Robert Light, and Katy Börner. 2015. "ProQuest Dissertation Analysis". 15th International Conference on Scientometrics and Informetrics, Istanbul, Turkey 292-293. Saket, Bahador, Carlos Scheidegger, Stephen Kobourov, and Katy Börner. 2015. "Map-Based Visualizations Increase Recall Accuracy of Data". EUROGRAPHICS 2015, Zürich, Switzerland 441-450. Börner, Katy, Russell Balliet, Adam V. Maltese, Stephen Miles Uzzo, and Joe E. Heimlich. 2015. "Data Visualization Literacy of Youth and Adult Science Museum Visitors". AERA 2015 Annual Meeting, Chicago, IL. Goldstone, Robert, Franco Pestilli, and Katy Börner. 2015. "Self-Portraits of the Brain: Cognitive Science, Data Visualization, and Communicating Brain Structure and Function". Trends in Cognitive Sciences 19 (8): 462-474. Larivière, Vincent, Stefanie Haustein, and Katy Börner. 2015. "Long-Distance Interdisciplinarity Leads to Higher Scientific Impact". PLoS ONE 10 (3): e0122565. doi: 10.1371/journal.pone.0122565. Schreiber, Falk, Andreas Kerren, Katy Börner, Hans Hagen, and Dirk Zeckzer. 2014. "Heterogeneous Networks on Multiple Levels". In Multivariate Network Visualization, edited by Kerren, Andreas, Helen C Purchase, and Matthew O Ward, 175-206. Springer International Publishing. Börner, Katy. 2014. "Plug-and-Play Macroscopes: Network Workbench (NWB), Science of Science Tool (Sci2), and Epidemiology Tool (Epic)". In Encyclopedia of Social Network Analysis and Mining, edited by Alhajj, Reda, and Jon Rokne, 1280-1290. New York, NY: Springer-Verlag. Kulanthaivel, Anand, Josette F. Jones, Robert Light, Katy Börner, and Chin Hua Kong. 2014. "Neurological Disorders and Publication Abstracts Follow Social Network-Type Node Patterns When Indexed Using Ontology Tree-Based Key Term Search". In Universal Access in Human-Computer Interaction: Aging and Assistive Environments, edited by Stephanidis, Constantine, and Margherita Antona, 278-288. Springer International Publishing. Börner, Katy, and David E. Polley. 2014. "Replicable Science of Science Studies". In Measuring Scholarly Impact: Methods and Practice, edited by Ding, Ying, Ronald Rousseau, and Dietmar Wolfram, Ch. 14, 321-341. Springer International Publishing. Börner, Katy, and David E. Polley. 2014. Visual Insights: A Practical Guide to Making Sense of Data. Cambridge, MA: The MIT Press. Murdock, Jaimie, Robert Light, Colin Allen, and Katy Börner. 2014. "Mapping the Intersection of Science & Philosophy". Proceedings of 13th ACM/IEEE-CS Joint Conference on Digital Libraries, Indianapolis, IN 405-406. Saket, Bahador, Paolo Simonetto, Stephen Kobourov, and Katy Börner. 2014. "Node, Node-Link, and Node-Link-Group Diagrams: An Evaluation". IEEE Visual Analytics Science and Technology, IEEE Information Visualization, and IEEE Scientific Visualization, Paris, France 20 (12): 2231-2240. Light, Robert, Jaimie Murdock, Colin Allen, and Katy Börner. 2014. "Challenges and Opportunities of the UCSD Map of Science‐Library of Congress Crosswalk". Proceedings of the VIVO/Science of Team Science (SciTS) 2014 Conference, Austin, TX. Börner, Katy, Todd Theriault, and Kevin W. Boyack. 2014. "Mapping Science: Past, Present and Future". BULLETIN of the Association for Information Science and Technology 41 (2): 12-16. Stipelman, Brooke, Kara L. Hall, Angela Zoss, Janet Okamoto, Daniel Stokols, and Katy Börner. 2014. "Mapping the Impact of Transdisciplinary Research: A Visual Comparison of Investigator Initiated and Team Based Tobacco Use Research Publications". The Journal of Translational Medicine and Epidemiology 2 (2): 1033. Bollen, Johan, David Crandall, Damion Junk, Ying Ding, and Katy Börner. 2014. "From Funding Agencies to Scientific Agency: Collective Allocation of Science Funding as an Alternative to Peer Review". EMBO Reports 15 (1): 1-121. Light, Robert, David E. Polley, and Katy Börner. 2014. "Open Data and Open Code for Big Science of Science Studies". Scientometrics 101 (2): 1535-1551. Reijnhoudt, Linda, Rodrigo Costas, Ed Noyons, Katy Börner, and Andrea Scharnhorst. 2014. "‘Seed+Expand’: A General Methodology for Detecting Publication Oeuvres of Individual Researchers". Scientometrics 101 (2): 1403-1417. Hook, Peter A. 2014. "The Structure and Evolution of the Academic Discipline of Law in the United States: Generation and Validation of Course-Subject Cooccurrence (CSCO) Maps". Thesis, Doctor of Philosophy in Library and Information Science: Katy Börner (Chair), Staša Milojevic, Cassidy Sugimoto, Jonathan Plucker, William Henderson. Indiana University, Bloomington, IN. Tallis, Marcelo, Chin Hua Kong, Katy Börner, and Gully APC Burns. 2013. "Analyses of Topics Maps Derived from Neuroanatomical Publications". Neuroinformatics 2013, Stockholm, Sweden. Light, Robert, Chin Hua Kong, and Katy Börner. 2013. "An Automated System for Tracking the Growth of Expert Profiling Systems". Joint Conference on Digital Libraries (JCDL), Indianapolis, IN. Reijnhoudt, Linda, Rodrigo Costas, Ed Noyons, Katy Börner, and Andrea Scharnhorst. 2013. "‘Seed+Expand’: A Validated Methodology for Creating High Quality Publication Oeuvres of Individual Researchers". Proceedings of International Society for Scientometrics and Informetrics Conference 2013, Vienna, Austria 2: 1587-1600. Light, Robert, David E. Polley, and Katy Börner. 2013. "Open Data and Open Code for Big Science of Science Studies". Proceedings of International Society for Scientometrics and Informetrics Conference 2013, Vienna, Austria 2: 1342-1356. Skupin, André, Joseph R. Biberstine, and Katy Börner. 2013. "Visualizing the Topical Structure of the Medical Sciences: A Self-Organizing Map Approach". PLoS ONE 8 (3): e58779. doi: 10.1371/journal.pone.0058779. Chen, Yunwei, Katy Börner, and Shu Fang. 2013. "Evolving Collaboration Networks in Scientometrics in 1978-2010: A Micro-Macro Analysis". Scientometrics 95 (3): 1051-1070. Bollen, Johan, David Crandall, Damion Junk, Ying Ding, and Katy Börner. 2013. " Collective Allocation of Science Funding: From Funding Agencies to Scientific Agency". arXiv:1304.1067. Mazloumian, Amin, Dirk Helbing, Sergi Lozano, Robert Light, and Katy Börner. 2013. "Global Multi-Level Analysis of the 'Scientific Food Web'". Scientific Reports 3 (1167). Conover, Michael. 2013. "Digital Democracy The Structure and Dynamics of Political Communication in a Large Scale Social Media Stream". Thesis, Doctor of Philosophy (Ph.D.), Informatics (Complex Systems Analysis). Indiana University, Bloomington, IN. Tank, Chintan, Micah Linnemeier, Chin Hua Kong, and Katy Börner. 2012. "Analyzing and Visualizing VIVO". In VIVO: A Semantic Approach to Scholarly Networking and Discovery, edited by Börner, Katy, Mike Conlon, Jon Corson-Rikert, and Ying Ding, Ch. 7. Williston, VT: Morgan & Claypool Publishers. Börner, Katy, Kevin W. Boyack, Stasa Milojevic, and Steven Morris. 2012. "An Introduction to Modeling Science: Basic Model Types, Key Definitions, and a General Framework for the Comparison of Process Models". In Models of Science Dynamics: Encounters Between Complexity Theory and Information Sciences, edited by Scharnhorst, Andrea, Katy Börner, and Peter van den Besselaar, Ch. 1, 3-22. Berlin: Springer-Verlag. Scharnhorst, Andrea, Katy Börner, and Peter van den Besselaar. 2012. "Foreword". In Models of Science Dynamics: Encounters Between Complexity Theory and Information Science, vii-x. Berlin: Springer-Verlag. Börner, Katy, Mike Conlon, Jon Corson-Rikert, and Ying Ding. 2012. VIVO: A Semantic Approach to Scholarly Networking and Discovery. Williston, VT: Morgan & Claypool Publishers. Albert, Paul, Kristi Holmes, Katy Börner, and Mike Conlon. 2012. "Research Discovery through Linked Open Data". Proceedings of the 12th ACM/IEEE-CS Joint Conference on Digital Libraries, Washington, D.C. 429-430. Biberstine, Joseph R., Katy Börner, Russell Jackson Duhon, Elisha F. Allgood, and André Skupin. 2012. "A Semantic Map of the last.fm Music Folksonomy". Seventh International Conference on Geographic Information Science (GIScience 2012), Columbus, OH. McDonald, Robert H., Jim Myers, Katy Börner, Beth Plale, Margaret Hedstrom, Ann Zimmerman, Jude Yew, Robert Light, David Cliff, Ryan Cobine, Stacy Kowalczyk, Kavitha Chrandasekar, Ram Prasanna, Praveen Kumar, Zaman Aktaruzzaman, Terry McLaren, Rob Kooper, and Luigi Marini. 2012. "Building a Data Discovery Network for Sustainability Science". VIVO Conference, Miami, FL. Alencar, Aretha Barbosa, Fernando Viera Paulovich, Katy Börner, and Maria Christina Ferreira de Oliveira. 2012. "Time-Aware Visualization of Document Collections". ACM Symposium on Applied Computing, Trento, Italy 1111-1118. Scharnhorst, Andrea, Katy Börner, and Peter van den Besselaar, eds. 2012. Models of Science Dynamics: Encounters Between Complexity Theory and Information Science. Berlin: Springer-Verlag. van Harmelen, Frank, George Kampis, Katy Börner, Peter van den Besselaar, Erik Schultes, Carol Goble, Paul Groth, Barend Mons, Stuart Anderson, Stefan Decker, Conor Hayes, Thierry Buecheler, and Dirk Helbing. 2012. "Theoretical And Technological Building Blocks For An Innovation Accelerator". European Physical Journal: Special Topics 214: 183-214. Börner, Katy. 2012. "Picturing Science". Nature 487: 430-431. Börner, Katy, Richard Klavans, Michael Patek, Angela Zoss, Joseph R. Biberstine, Robert Light, Vincent Larivière, and Kevin W. Boyack. 2012. "Design and Update of a Classification System: The UCSD Map of Science". PLoS One 7 (7): e39464. doi: 10.1371/journal.pone.0039464. Zoss, Angela, and Katy Börner. 2012. "Mapping Interactions Within the Evolving Science of Science and Innovation Policy Community". Scientometrics 91 (2): 631-644. Cottam, Joseph. 2012. "Design and Implementation of a Stream-Based Visualization Language". Thesis, Doctor of Philosophy in Computer Science: Andrew Lumsdaine (Chair), Amr Sabry, Katy Börner, Indiana University, Bloomington and Chris Weaver, University of Oklahoma. Indiana University, Bloomington, IN. Börner, Katy. 2011. "Network Science: Theory, Tools and Practice". In Leadership in Science and Technology: A Reference Handbook, edited by Bainbridge, William S, 49-59. Thousand Oaks, CA: SAGE Publications. Zoss, Angela, and Katy Börner. 2011. "Mapping Interactions Within the Evolving Science of Science and Innovation Policy Community". Proceedings of the 13th International Conference of the International Society for Scientometrics and Informetrics, Durban, South Africa 2: 924-935. Stamper, Michael, Chin Hua Kong, Nianli Ma, Angela Zoss, and Katy Börner. 2011. " MAPSustain: Visualising biomass and biofuel research ". Proceedings of Making Visible the Invisible: Art, Design and Science in Data Visualization, Huddersfield, UK 57-61. Chen, Yunwei, Shu Fang, and Katy Börner. 2011. "Mapping the Development of Scientometrics: 2002 to 2008". Journal of Library Science in China 3: 131-146. Guo, Hanning, Scott B. Weingart, and Katy Börner. 2011. "Mixed-Indicators Model for Identifying Emerging Research Areas". Scientometrics 89 (1): 421-435. Boyack, Kevin W., David Newman, Russell Jackson Duhon, Richard Klavans, Michael Patek, Joseph R. Biberstine, Bob Schijvenaars, André Skupin, Nianli Ma, and Katy Börner. 2011. "Clustering More Than Two Million Biomedical Publications: Comparing the Accuracies of Nine Text-Based Similarity Approaches". PLoS ONE 6(3): e18029. doi:10.1371/journal.pone.0018029 . Börner, Katy. 2011. "Plug-and-Play Macroscopes". Communications of the ACM 54 (3): 60-69. Wagner, Caroline, J. David Roessner, Kamau Bobb, Julie Thompson Klein, Kevin W. Boyack, Joann Keyton, Ismael Rafols, and Katy Börner. 2011. "Approaches to Understanding and Measuring Interdisciplinary Scientific Research (IDR): A Review of the Literature". Journal of Informetrics 5 (1): 14-26. Kowalczyk, Stacy. 2011. "e-Science Data Environments: A View from the Lab Floor". Thesis, Doctor of Philosophy in Library and Information Science: Katy Börner (Chair), Debora Shaw, Alan Dennis, Stasa Milojevic, Beth Plale. Indiana University, Bloomington, IN. Börner, Katy, and Kevin W. Boyack. 2010. "Mapping Interdisciplinary Research (sidebar, Systems Science Section)". In Oxford Handbook of Interdisciplinarity, edited by Frodeman, Robert, Julie Thompson Klein, and Carl Mitcham, Ch. 31, 457-460. New York, NY: Oxford University Press. Börner, Katy. 2010. Atlas of Science: Visualizing What We Know. Cambridge, MA: The MIT Press. Zoss, Angela, Michael Conover, and Katy Börner. 2010. "Where Are the Academic Jobs? Interactive Exploration of Job Advertisements in Geospatial and Topical Space". Advances in Social Computing: Third International Conference on Social Computing, Behavioral Modeling and Prediction, Bethesda, MD 238-247. Falk-Krzesinski, Holly J., Katy Börner, Noshir S. Contractor, Jonathon Cummings, Stephen M. Fiore, Kara L. Hall, Joann Keyton, Bonnie Spring, Daniel Stokols, William Trochim, and Brian Uzzi. 2010. "Advancing the Science of Team Science". Clinical and Translational Science 3 (5): 263-266. Börner, Katy, Noshir S. Contractor, Holly J. Falk-Krzesinski, Stephen M. Fiore, Kara L. Hall, Joann Keyton, Bonnie Spring, Daniel Stokols, William Trochim, and Brian Uzzi. 2010. "A Multi-Level Systems Perspective for the Science of Team Science". Science Translational Medicine 2 (49): 49(cm)24. Ding, Ying, Yuyin Sun, Bin Chen, Katy Börner, Li Ding, David Wild, Melanie Wu, Dominic DiFranzo, Alvaro Graves Fuenzalida, Daifeng Li, Stasa Milojevic, ShanShan Chen, and Madhuvanthi Sankaranarayanan. 2010. "Semantic Web Portal: A Platform for Better Browsing and Visualizing Semantic Data". Lecture Notes in Computer Science 6335: 448-460. Börner, Katy, Weixia (Bonnie) Huang, Micah Linnemeier, Russell Jackson Duhon, Patrick Phillips, Nianli Ma, Angela Zoss, Hanning Guo, and Mark Price. 2010. "Rete-Netzwerk-Red: Analyzing and Visualizing Scholarly Networks Using the Network Workbench Tool". Scientometrics 83 (3): 863-876. Meiss, Mark. 2010. "Structural Mining of Large-Scale Behavioral Data from the Internet". Thesis, Doctor of Philosophy in Computer Science: Filippo Menczer (Chair), Alessandro Vespignani, Katy Börner, Minaxi Gupta, Kay Connelly. Indiana University, Bloomington, IN. Börner, Katy, Robin M. Wagner, Nianli Ma, Joseph R. Biberstine, Rediet Berhane, Hong Jiang, Susan E. Ivey, Katrina Pearson, and Carl McCabe. 2010. "Introducing the Science of Science (Sci2) Tool to the Reporting Branch, Office of Extramural Research/Office of the Director, National Institutes of Health". Workshop on the Science of Science Measurement, December 2-3, Washington D.C.
Börner, Katy, Noshir S. Contractor, Holly J. Falk-Krzesinski, Stephen M. Fiore, Kara L. Hall, Joann Keyton, Bonnie Spring, Daniel Stokols, William Trochim, and Brian Uzzi. 2010. "The Science of Team Science (SciTS): A Beacon for 21st Century Scientific Collaboration". SBE 2020: Future Research in the Social, Behavioral & Economic Sciences. Börner, Katy, and Angela Zoss. 2010. "Evolving and Emerging Populations and Topics". CISE/SBE Advisory Committee on Research Portfolio Analysis. Börner, Katy. 2010. "Briefing Document for "Changing the Conduct of Science in the Information Age" NSF Workshop". Hill, Christopher, William B. Bonvillian, Katy Börner, Mary K. Feeney, David Goldston, Nancy J. Kirkendall, Julie Thompson Klein, Kei Koizumi, J. David Roessner, Martha M. Taylor, Thomas J. Plewes, and Michael J. Siri. 2009. Data on Federal Research and Development Investments: A Pathway to Modernization. Panel on Modernizing the Infrastructure of the National Science Foundation Federal Funds Survey. The National Academies Press, Washington DC. Guo, Hanning, Katy Börner, and Zeyuan Liu. 2009. "Mapping the Domain of "Intelligent Perception Technology" Research". Proceedings of the Fifth International Conference on Webometrics, Informetrics and Scientometrics (WIS) and the Tenth COLLNET Meeting, Seoul, South Korea. Herr II, Bruce W., Edmund M Talley, Gully APC Burns, David Newman, and Gavin LaRowe. 2009. "The NIH Visual Browser: An Interactive Visualization of Biomedical Research". Proceedings of the 13th International Conference on Information Visualization (IV09), Barcelona, Spain 505-509. Börner, Katy, Weixia (Bonnie) Huang, Micah Linnemeier, Russell Jackson Duhon, Patrick Phillips, Nianli Ma, Angela Zoss, Hanning Guo, and Mark Price. 2009. "Rete-Netzwerk-Red: Analyzing and Visualizing Scholarly Networks Using the Scholarly Database and the Network Workbench Tool". Proceedings of 12th International Conference on Scientometrics and Informetrics, Rio de Janeiro, Brazil 2: 619-630. Wernert, Eric, Jagannathan Lakshmipathy, Michael Boyles, and Katy Börner. 2009. "ID2 - A Scalable and Flexible Mixed-Media Information Visualization System for Public Learning Exhibits ". Proceedings of the World Conference on Educational Multimedia, Hypermedia and Telecommunications, Honolulu, HI 3848-3856. Börner, Katy, Fileve Palmer, Julie M. Davis, Elisha F. Allgood, Stephen Miles Uzzo, and Bryan J. Hook. 2009. "Teaching Children the Structure of Science". SPIE Conference on Visualization and Data Analysis, San Jose, CA 7243: 724307: 1-14. 2009. "Visualization and Data Analysis 2009". Proceedings of SPIE 7243. Duhon, Russell Jackson. 2009. "Understanding Outside Collaborations of the Chinese Academy of Sciences Using Jensen-Shannon Divergence". Proceedings of SPIE-IS&T Visualization and Data Analysis Conference, San Jose, CA 7243: 72430C . Börner, Katy, and Andrea Scharnhorst, eds. 2009. "Science of Science: Conceptualizations and Models of Science". Journal of Informetrics 3 (3). LaRowe, Gavin, Sumeet Adinath Ambre, John W. Burgoon, Weimao Ke, and Katy Börner. 2009. "The Scholarly Database and Its Utility for Scientometrics Research". Scientometrics 79 (2): 219-234. Boyack, Kevin W., Katy Börner, and Richard Klavans. 2009. "Mapping the Structure and Evolution of Chemistry Research". Scientometrics 79 (1): 45-60. Vital, Cuauhcihuatl. 2009. "Graph Theory in Animal Behavior and the Social Role of Gatekeepers on Group Learning in Zebrafish Shoals, Danio Rerio". Thesis, Doctor of Philosophy in Biology: Emilia P. Martins (Chair), Katy Börner, Elizabeth Housworth, Michael J. Wade. Indiana University, Bloomington, IN. Börner, Katy, Nianli Ma, Russell Jackson Duhon, and Angela Zoss. 2009. "Science & Technology Assessment Using Open Data and Open Code". IEEE Intelligent Systems 24 (4): 78-81. Markines, Ben. 2009. "Socially Induced Semantic Networks and Applications". Thesis, Doctor of Philosophy in Computer Science: Filippo Menczer (Chair), Katy Börner, Randall Bramley, Dr. Dennis Groth. Indiana University, Bloomington, IN. Börner, Katy, Luis M. A. Bettencourt, Mark Gerstein, and Stephen Miles Uzzo. 2009. "Knowledge Management and Visualization Tools in Support of Discovery". NSF Workshop Report, Indiana University, Los Alamos National Laboratory, Yale University, and New York Hall of Science. Linnemeier, Micah, Timothy Kelley, Weixia (Bonnie) Huang, Bruce W. Herr II, and Russell Jackson Duhon. 2008. "Rete-Netzwerk-Red: Network Workbench - Analyzing and Visualizing Scholarly Networks Extracted from Online Bibliographic Resources". International Workshop and Conference on Network Science, Norwich, UK CT2.5.3. Herr II, Bruce W., Russell Jackson Duhon, Katy Börner, Elisha F. Allgood, and Shashikant Penumarthy. 2008. "113 Years of Physical Review: Using Flow Maps to Show Temporal and Topical Citation Patterns". Proceedings of the 12th Information Visualization Conference (IV 2008), London, UK 421-426. Donaldson, Justin, and William Richard Hazlewood. 2008. "Candidate Mapping: Finding Your Place Amongst the Candidates". 12th International Conference on Information Visualization, London, UK iv: 63-68. Mons, Barend, Michael Ashburner, Christine Chicester, Erik Van Mulligen, Marc Weeber, Johan den Dunnen, Gert-Jan van Ommen, Mark Musen, Matthew Cockerill, Henning Hermjakob, Albert Mons, Abel Packer, Roberto Pacheco, Suzanna Lewis, Alfred Berkeley, William Melton, Nicolas Barris, Jimmy Wales, Gerard Meijssen, Erik Moeller, Peter Jan Roes, Katy Börner, and Amos Bairoch. 2008. "Calling on a Million Minds for Community Annotation in WikiProteins". Genome Biology 9 (5): R89. LaRowe, Gavin, Sumeet Adinath Ambre, John W. Burgoon, Weimao Ke, and Katy Börner. 2008. "The Scholarly Database and its Utility for Scientometrics Research". Scientometrics: Online First. Börner, Katy, and Elisha F. Allgood. 2008. "Networks and Complex Systems Talks". Herr II, Bruce W. 2008. "Using the Network Workbench". Indiana University Bloomington. Kowalczyk, Stacy. 2007. "Digital Preservation by Design". In Handbook of Research on Global Information Technology, edited by Raisinghani, Mahesh S. New York, NY: IGI Publishing. Herr II, Bruce W., Weixia (Bonnie) Huang, Shashikant Penumarthy, and Katy Börner. 2007. "Designing Highly Flexible and Usable Cyberinfrastructures for Convergence". In Progress in Convergence - Technologies for Human Wellbeing, edited by Bainbridge, William S., and Mihail C. Roco, 161-179. Boston, MA: Annals of the New York Academy of Sciences. Burns, Gully APC, Bruce W. Herr II, David Newman, Tommy Ingulfsen, Patric Pantel, and Padhraic Smyth. 2007. "A Snapshot of Neuroscience: Unsupervised Natural Language Processing of Abstracts from the Society for Neuroscience 2006 Annual Meeting". Society for Neuroscience 2007 Annual Meeting, San Diego, CA. LaRowe, Gavin, Sumeet Adinath Ambre, John W. Burgoon, Weimao Ke, and Katy Börner. 2007. "The Scholarly Database and its Utility for Scientometrics Research". Proceedings of the 11th International Conference on Scientometrics and Informetrics, Madrid, Spain 457-462. Boyack, Kevin W., Katy Börner, and Richard Klavans. 2007. "Mapping the Structure and Evolution of Chemistry Research". Proceedings of the 11th International Conference on Scientometrics and Informetrics, Madrid, Spain 112-123. Hook, Peter A. 2007. "Visualizing the Topic Space of the United States Supreme Court". Proceedings of the 11th International Conference on Scientometrics and Informetrics, Madrid, Spain 387-396. Hook, Peter A. 2007. "Network Derived Domain Maps of the Work of the United States Supreme Court: 50 Years of Co-Voting Data and a Case Study on Abortion". International Workshop and Conference on Network Science, New York, NY. Boyack, Kevin W., Richard Klavans, W. Bradford Paley, and Katy Börner. 2007. "Mapping, Illuminating, and Interacting with Science". International Conference on Computer Graphics and Interactive Techniques ACM Siggraph 2007 Sketches, San Diego, CA. Herr II, Bruce W., Weimao Ke, Elisha F. Allgood, and Katy Börner. 2007. "Movies and Actors: Mapping the Internet Movie Database". Proceedings of the 11th Annual Information Visualization International Conference, Zurich, Switzerland 465-469. LaRowe, Gavin, Ryutaro Ichise, and Katy Börner. 2007. "Visualizing Japanese Co-Authorship Data". Proceedings of the 11th Annual Information Visualization International Conference, Zurich, Switzerland 459-464. Neirynck, Thomas, and Katy Börner. 2007. "Representing, Analyzing, and Visualizing Scholarly Data in Support of Research Management". Proceedings of the 11th Annual Information Visualization International Conference, Zurich, Switzerland 124-129. Mane, Ketan K., and Katy Börner. 2007. "Computational Diagnostics: A Novel Approach to Viewing Medical Data". Proceedings of the Fifth International Conference on Coordinated and Multiple Views in Exploratory Visualization, Zurich, Switzerland 27-34. Hook, Peter A. 2007. "Domain Maps: Purposes, History, Parallels with Cartography, and Applications". Conference Proceedings of 11th Annual Information Visualization International Conference, Zurich, Switzerland 442-446. Skupin, André, and Katy Börner, eds. 2007. "Special Issue on Mapping Humanity's Knowledge and Expertise in the Digital Domain". Environment and Planning B: Planning and Design 34 (5). Burkhard, Remo Aslak, Gennady Andrienko, Natalia Andrienko, Alan Blackwell, Katy Börner, Dominique Brodbeck, Jason Dykes, Martin Eppler, Jean-Daniel Fekete, Armin Grun, Bruce W. Herr II, Jeffrey Huang, Wolfgang Kienreich, Alexander Koutamanis, Silke Lang, Mark Meagher, Daniel Perrin, Robert Phaal, Andrew Vande Moere, and Wibke Weber. 2007. "Visualization Summit 2007: Ten Research Goals for 2010". Information Visualisation 6 (3): 169-188. Börner, Katy. 2007. "Making Sense of Mankind's Scholarly Knowledge and Expertise: Collecting, Interlinking, and Organizing What We Know and Different Approaches to Mapping (Network) Science". Environment and Planning B: Planning and Design 34 (5): 808-825. Skupin, André, and Katy Börner. 2007. "Guest Editorial". Environment and Planning B: Planning and Design 34 (5): 765-766. Börner, Katy, Elisha F. Allgood, Bruce W. Herr II, Todd Holloway, and W. Bradford Paley. 2007. "Taxonomy Visualization in Support of the Semi-Automatic Validation and Optimization of Organizational Schemas". Journal of Infometrics 1 (3): 214-225. Holloway, Todd, Miran Boičević, and Katy Börner. 2007. "Analyzing and Visualizing the Semantic Coverage of Wikipedia and Its Authors". Complexity, Special Issue on Understanding Complex Systems 12 (3): 30-40. Börner, Katy, Soma Sanyal, and Alessandro Vespignani. 2007. "Network Science". Annual Review of Information Science & Technology 41: 537-607. Hook, Peter A. 2007. "The Aggregate Harmony Metric and a Statistical and Visual Contextualization of the Rehnquist Court: 50 Years of Data". Constitutional Commentary 24 (1): 221-264. Börner, Katy. 2006. "Semantic Association Networks: Using Semantic Web Technology to Improve Scholarly Knowledge and Expertise Management". In Visualizing the Semantic Web, 2nd Edition, edited by Geroimenko, Vladimir, and Chaomei Chen, Ch. 11, 183-198. London: Springer-Verlag. Penumarthy, Shashikant, and Katy Börner. 2006. "Analysis and Visualization of Social Diffusion Patterns in Three-Dimensional Virtual Worlds". In Avatars at Work and Play: Collaboration and Interaction in Shared Virtual Environments (Computer Supported Cooperative Work), edited by Schroeder, Ralph, and Ann-Sofie Axelsson, Ch. 3, 39-61. Netherlands: Springer. Huang, Weixia (Bonnie), Bruce W. Herr II, Shashikant Penumarthy, Ben Markines, and Katy Börner. 2006. "CIShell - A Plug-in Based Software Architecture and Its Usage to Design an Easy to Use, Easy to Extend Cyberinfrastructure for Network Scientists". International Conference and Workshop on Network Science, Bloomington, IN. Murray, Colin, Weimao Ke, and Katy Börner. 2006. "Mapping Scientific Disciplines and Author Expertise Based on Personal Bibliography Files". Tenth International Conference on Information Visualisation, London, UK 258-263. Mane, Ketan K., and Katy Börner. 2006. "SRS Browser: A Visual Interface to the Sequence Retrieval System". SPIE Conference on Visualization and Data Analysis, San Jose, CA 6060: 606010: 1-11. Vital, Cuauhcihuatl, Emilia P. Martins, and Katy Börner. 2006. "Analysis of Cowbird Social Networks with Graph Theory Metrics". International Conference and Workshop on Network Science, Bloomington, IN. Janssen, Marco A., Michael Schoon, Weimao Ke, and Katy Börner. 2006. "Scholarly Networks on Resilience, Vulnerability and Adaptation within the Human Dimensions of Global Environmental Change". Global Environmental Change, Special Issue on Resilience, Vulnerability and Adaptation 16 (3): 240-252. Börner, Katy, Shashikant Penumarthy, Mark Meiss, and Weimao Ke. 2006. "Mapping the Diffusion of Information among Major U.S. Research Institutions". Scientometrics 68 (3): 415 - 426. Mane, Ketan K. 2006. "Envisioning Knowledge: Tightly Coupling Knowledge Analysis and Visualization". Thesis, Doctor of Philosophy in Library and Information Science: Katy Börner (Chair), Javed Mostafa, Luis Rocha, Sun Kim. Indiana University, Bloomington, IN. Sanyal, Soma. 2006. "Effect of Citation Patterns on Network Structure". arXiv.org arXiv:physics/0611139v. Börner, Katy. 2006. "Science of Science Policy Position Paper". Workshop on Science of Science Policy: Developing our Understanding of Public Investments in Science, Helsinki, Finland. Börner, Katy. 2006. "Mapping Science". International Conference and Workshop on Network Science, May 16 - 25, Bloomington, Indiana. McRobbie, Michael. 2006. "Global Research Network Operations Center". Indiana University 1.2. McRobbie, Michael. 2006. "Advanced Cyberinfrastructure Facility". Indiana University 1.2. Mahoui, Malika, Harshad Kulkarni, Nianhua Li, Zina Ben-Miled, and Katy Börner. 2005. "Semantic Correspondence in Federated Life Science Data Integration Systems". In Data Integration in the Life Sciences, Lecture Notes in Computer Science, edited by Ludscher, Bertram, and Louiqa Raschid, 137-144. Berlin: Springer-Verlag. Hook, Peter A, and Katy Börner. 2005. "Educational Knowledge Domain Visualizations: Tools to Navigate, Understand, and Internalize the Structure of Scholarly Knowledge and Expertise". In New Directions in Cognitive Information Retrieval, edited by Spink, Amanda, and Charles Cole, Ch. 5, 187-208. Netherlands: Springer. Börner, Katy. 2005. "Several Entries". In Encyclopedia on Human Computer Interaction in Popular Culture. Great Barrington, MA: Berkshire Publishing Group. Börner, Katy, Shashikant Penumarthy, Bonnie Jean DeVarco, and Carol Kerney. 2005. "Visualizing Social Patterns in Virtual Environments on a Local and Global Scale". In Digital Cities III. Information Technologies for Social Capital: Cross-cultural Perspectives, Lecture Notes in Computer Science, edited by van den Besselaar, Peter, and Satoshi Koizumi, 325-340. Berlin: Springer-Verlag. Ke, Weimao, and Katy Börner. 2005. "Mapping the Social Network and Expertise of "Network Science" Researchers". In Report to the U.S. National Research Council study on Network Science, 88-92. Washington, DC: The National Academies Press. Collins, Linn Marks, Ketan K. Mane, Mark L. B. Martinez, Jeremy A.T. Hussel, and Richard E. Luce. 2005. "ScienceSifter: Facilitating Activity Awareness in Collaborative Research Groups through Focused Information Feeds". First International Conference on e-Science and Grid Computing, Melbourne, Australia 40-47. Holloway, Todd, Ana G. Maguitman, Ben Markines, Fillipo Menczer, and Lubomira Stoilova. 2005. "GiveALink: Mining a Semantic Network of Bookmarks for Web Search and Recommendation". Proceedings of the 3rd International Workshop on Link Discovery LinkKDD2005, Chicago, IL 66-73. Herring, Susan C., Inna Kouper, John Paolillo, Lois Ann Scheidt, Michael Tyworth, Peter Welsch, Elijah Wright, and Ning Yu. 2005. "Conversations in the Blogosphere: An Analysis". Proceedings of the Thirty-Eighth Hawaii International Conference on System Sciences, Big Island, HI 4: 107b. Fletcher, George, Hardik Sheth, and Katy Börner. 2005. "Unstructured Peer-to-Peer Networks: Topological Properties and Search Performance". Agents and Peer-to-Peer Computing: Third International Workshop, AP2PC 2004. New York, NY 14-27. Ragg, Susanne, Terry Vik, N. D. Lee, Nianhua Li, Zina Ben-Miled, Malika Mahoui, Ketan K. Mane, and Katy Börner. 2005. "Database Integration and Data Visualization for Biomarker Detection in Pediatric Cancer". 37th Congress of the International Society of Pediatric Oncology, Vancouver, Canada 433. Fu, YueYu, Weimao Ke, and Javed Mostafa. 2005. "Automated Text Classification Using a Multi-Agent Framework". Proceedings of the 5th ACM/IEEE-CS Joint Conference on Digital Libraries. Tools & Techniques Track: Supporting Classification, Denver, CO 157-158. Börner, Katy, and Shashikant Penumarthy. 2005. "Spatio-Temporal Information Production and Consumption of Major U.S. Research Institutions". Proceedings of International Society of Scientometrics and Informetrics Conference 2005, Stockholm, Sweden 1: 635-641. Murray, Colin, Weimao Ke, Hana Milanaov, Mark Meiss, Shravan Rajagopal, and Katy Börner. 2005. "Geographical Visualization of Technology Data in the US". IEEE InfoVis 2005 Contest Entry, Minneapolis, MN. Mane, Ketan K., and Javed Mostafa. 2005. "Exploring the Impact of Information Visualization on Medical Information Seeking Using the Web". HCI International, Las Vegas, NV. Börner, Katy, and Raquel Navarro-Prieto, eds. 2005. "Special Issue on Collaborative Information Visualization Environments". PRESENCE: Teleoperators and Virtual Environments, Special Issue on Collaborative Information Visualization Environments 14 (1): iii-iv. Börner, Katy, and Javed Mostafa, eds. 2005. "Special Issue on Information Visualization Interfaces for Retrieval and Analysis". 5 (1). Börner, Katy, Luca Dall'Asta, Weimao Ke, and Alessandro Vespignani. 2005. "Studying the Emerging Global Brain: Analyzing and Visualizing the Impact of Co-Authorship Teams". Complexity: Special Issue on Understanding Complex Systems 10 (4): 57-67. Boyack, Kevin W., Richard Klavans, and Katy Börner. 2005. "Mapping the Backbone of Science". Scientometrics 64 (3): 351-374. Ord, Terry J., Emilia P. Martins, Sidharth Thakur, Ketan K. Mane, and Katy Börner. 2005. "Trends in Animal Behaviour Research (1968-2002): Ethoinformatics and Mining Library Databases". Animal Behaviour 69 (6): 1399-1413. Chen, Chaomei, and Katy Börner. 2005. "From Spatial Proximity to Semantic Coherence: A Quantitative Approach to the Study of Group Dynamics in Collaborative Virtual Environments". PRESENCE: Teleoperators and Virtual Environments, Special Issue on Collaborative Information Visualization Environments 14 (1): 81-103. Fu, YueYu, Weimao Ke, and Javed Mostafa. 2005. "Advanced Information Retrieval Web Services for Digital Libraries". Library Collections, Acquisitions, and Technology Services 29 (2): 220-224. Ragg, Susanne, M. B. Rosenman, E. M. Doucette, Zhong Yan, Julie C. Haydon, J. H. Paine, N. D. Lee, Terry Vik, Ketan K. Mane, and Katy Börner. 2005. "Data Visualization of Multiparameter Information in Acute Lymphoblastic Leukemia Expands the Ability to Explore Prognostic Factors". Blood 106 (11): 254A-254A 862, Part 1. Kowalczyk, Stacy. 2005. "Electronic Journal Archiving and Preservation Annotated Bibliography". L702: Research Practicum, School of Library and Information Science, Indiana University. Kowalczyk, Stacy. 2005. "Digital Preservation Cross Discipline Survey". L709: Introduction to Research and Statistics, School of Library and Information Science, Indiana University. Börner, Katy. 2005. "Places & Spaces Exhibit Movie". Fu, YueYu, and Javed Mostafa. 2004. "Integration of Biomedical Text and Sequence OAI Repositories". Proceedings of the 4th ACM/IEEE-CS Joint Conference on Digital Libraries, Tucson, AZ 25-26. Yang, Kiduk, Elin Jacob, Aaron Loehrlein, Seungmin Lee, and Ning Yu. 2004. "The Best of Both Worlds: A Hybrid Approach to the Construction of Faceted Vocabularies". Asia Information Retrieval Symposium. Beijing, China 18-20. Thakur, Sidharth, Ketan K. Mane, Katy Börner, Emilia P. Martins, and Terry J. Ord. 2004. "Content Coverage of Animal Behavior Data". Visualization and Data Analysis, San Jose, CA 5295: 305-311. 2004. "Proceedings of the Eighth International Conference on Information Visualization". IV2004 Conference, London, UK. Ke, Weimao, Katy Börner, and Lalitha Viswanath. 2004. "Major Information Visualization Authors, Papers and Topics in the ACM Library. Analysis and Visualization of the IV 2004 Contest Dataset". Proceedings of the IEEE Symposium on Information Visualization, IEEE Computer Society Washington, DC page 216.1. Börner, Katy, Ryan Johnathan Jones, Gyeongja Jun Lee, and Shashikant Penumarthy. 2004. "Visualizing the VLearn3D 2002 Conference in Space and Time". Visualization and Data Analysis, San Jose, CA 5295: 24-32. 2004. "Visualization and Data Analysis 2004". Proceedings of SPIE 5295. Boyack, Kevin W., Ketan K. Mane, and Katy Börner. 2004. "Mapping Medline Papers, Genes, and Proteins Related to Melanoma Research". IV2004 Conference, London, UK 965-971. Kutz, Daniel. 2004. "Examining the Evolution and Distribution of Patent Classifications". IV2004 Conference, London, UK 983-988. Sooriamurthi, Raja, Arijit Sengupta, Suzanne Menzel, Katie Moor, Sid Stamm, and Katy Börner. 2004. "Java Engagement for Teacher Training: An Experience Report". Proceedings of the Frontiers in Education Conference, Savannah, GA T2D 1-6. Jacob, Elin, Seungmin Lee, Aaron Loehrlein, Kiduk Yang, and Ning Yu. 2004. "Organizing the Web: Semi Automatic Construction of a Faceted Scheme". Proceedings of IADIS International Conference WWW/Internet, Madrid, Spain 374-381. Penumarthy, Shashikant, and Katy Börner. 2004. 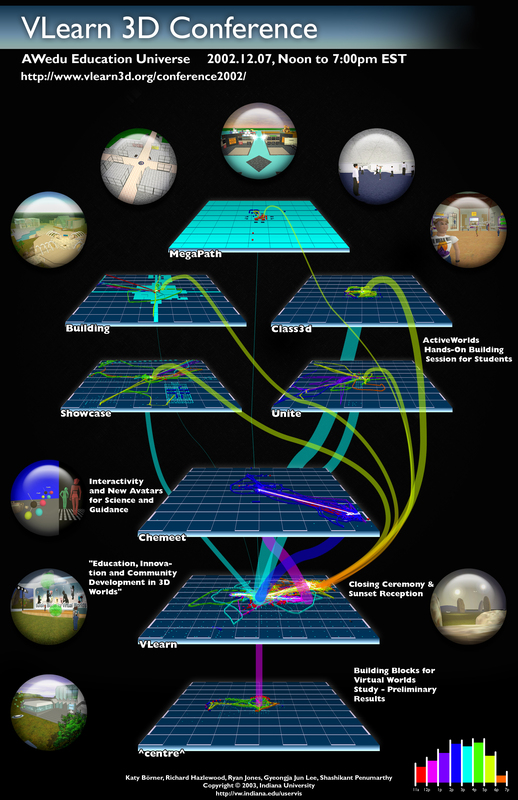 "The ActiveWorld Toolkit: Analyzing and Visualizing Social Diffusion Patterns in 3D Virtual Worlds". Workshop on Virtual Worlds at the First International Conference on Design Computing and Cognition, MIT, Boston, MA 39-43. Fu, YueYu, and Javed Mostafa. 2004. "Toward Information Retrieval Web Services for Digital Libraries". IEEE/ACM Joint Conference on Digital Libraries 2004, Tucson, AZ 370-371. Shiffrin, Richard M., and Katy Börner, eds. 2004. "Mapping Knowledge Domains". Proceedings of the National Academy of Sciences of the United States of America 101 (Suppl. 1): 5183-5185. Shiffrin, Richard M., and Katy Börner. 2004. "Introduction: Mapping Knowledge Domains". Proceedings of the National Academy of Sciences of the United States of America 101 (Suppl. 1): 5183-5185. Mane, Ketan K., and Katy Börner. 2004. "Mapping Topics and Topic Bursts in PNAS". Proceedings of the National Academy of Sciences of the United States of America 101 (Suppl. 1): 5287-5290. Penumarthy, Shashikant, Ketan K. Mane, and Katy Börner. 2004. "A Toolkit for Large Scale Network Analysis". Technical Report SLISWP-04-02, SLIS, Indiana University. Börner, Katy. 2004. "Designing Social Digital Libraries". Indiana Libraries: Recruiting and Retaining Librarians in Indiana February. Kowalczyk, Stacy. 2004. "Digital Preservation Annotated Bibliography". L701 class paper. Börner, Katy, Elijah Wright, and Caroline Courtney. 2004. "Information Processing Talks 2003-2004". Börner, Katy. 2003. "Computers and Knowledge Sharing". In Encyclopedia of Community: From the Village to the Virtual World, edited by Christensen, Karen, and David Levinson, 314-316. Thousand Oaks, CA: Sage. Börner, Katy, and Shashikant Penumarthy. 2003. "Maps of Virtual Worlds". In Information Design Source Book, edited by , IIDj Institute for Information Design Japan. Tokyo: Graphic-sha Publishing. Mane, Ketan K., and Sidharth Thakur. 2003. "Oncosifter: A Customized Approach to Cancer Information". Information Visualization Interfaces for Retrieval and Analysis Conference at Joint Conference on Digital Libraries, Houston, TX. Mostafa, Javed, and Katy Börner. 2003. "International Workshop on Information Visualization Interfaces for Retrieval and Analysis (IVIRA) at the Joint Conference on Digital Libraries 2003". Third ACM+IEEE Joint Conference on Digital Libraries, Houston, TX 416. 2003. "Proceedings of the Seventh International Conference on Information Visualization". Seventh International Conference on Information Visualization - IV 2003, July 16-18. Börner, Katy, William Richard Hazlewood, Ryan Johnathan Jones, Gyeongja Jun Lee, and Shashikant Penumarthy. 2003. "VLearn 3D Conference (Poster)". VLearn 3D Conference. Semifinalist for the Science and Engineering Visualization Challenge by National Science Foundation and the Journal Science, St. Malo, France. Baumgartner, Jason, Katy Börner, Nathan James Deckard, and Nihar Sheth. 2003. "An XML Toolkit for an Information Visualization Software Repository". Poster Compendium. IEEE Information Visualization Conference, Seattle, WA 72-73. Sheth, Nihar, Katy Börner, Jason Baumgartner, Ketan K. Mane, and Eric Wernert. 2003. "Treemap, Radial Tree and 3D Tree Visualizations". Poster Compendium. IEEE Information Visualization Conference, Seattle, WA 128-129. Heines, Jesse M., Melody Ivory, Katy Börner, and Ed Gehringer. 2003. "The Development, Maintenance, and Use of Course Web Sites". ACM SIGCSE 34th Technical Symposium on Computer Science Education, Reno, NV 94-95. Erbacher, Robert F., Philip C. Chen, Matti Gröhn, Jonathan C. Roberts, and Katy Börner, eds. 2003. Proceedings of SPIE 2003: Visualization and Data Analysis. SPIE 2003: Visualization and Data Analysis, Santa Clara, CA, Jan. 21. SPIE-IS&T. Börner, Katy, and Shashikant Penumarthy. 2003. "Social Diffusion Patterns in Three-Dimensional Virtual Worlds". Information Visualization 2 (3): 182-198. Mostafa, Javed, and Katy Börner. 2003. "Information Visualization Interfaces for Retrieval and Analysis (IVIRA) Workshop Summary". D-Lib Magazine 9 (7/8). Fu, YueYu, Larry Mongin, and Javed Mostafa. 2003. "Open Archives Data Service Prototype and Automated Subject Indexing Using D-Lib+ Archive Content as a Testbed". D-Lib Magazine 9 (12). Börner, Katy, Chaomei Chen, and Kevin W. Boyack. 2003. "Visualizing Knowledge Domains". Annual Review of Information Science & Technology 37: 179-255. Herring, Susan C., Katy Börner, and Maggie B. Swan. 2003. "When Rich Media are Opaque: Spatial Reference in a 3-D Virtual World. Submitted to Computer Supported Cooperative Work". The Journal of Collaborative Computing. Boyack, Kevin W., and Katy Börner. 2003. "Indicator-Assisted Evaluation and Funding of Research: Visualizing the Influence of Grants on the Number and Citation Counts of Research Papers". Journal of the American Society of Information Science and Technology, Special Topic Issue on Visualizing Scientific Paradigms 54 (5): 447-461. Mane, Ketan K., and Katy Börner. 2003. "Content Coverage of PNAS in 1982-2001". Technical Report SLISWP-03-02 Presentation at the SLIS Student Conference at Indiana University won the 1st prize. Börner, Katy, and Chaomei Chen. 2003. "Visual User Interfaces: Challenges and Opportunities". IEEE-CS Technical Committee on Digital Libraries' Bulletin 1 (1). Börner, Katy. 2003. "Building Social Digital Libraries". Indiana Libraries: Recruiting and Retaining Librarians in Indiana 22 (2): 20-22. Börner, Katy, Debora Shaw, and Elijah Wright. 2003. "Information Processing Talks 2002-2003". Börner, Katy, and Chaomei Chen. 2002. "Visual Interfaces to Digital Libraries: Motivation, Utilization and Socio-Technical Challenges". In Lecture Notes in Computer Science: Visual Interfaces to Digital Libraries, edited by Börner, Katy, and Chaomei Chen, 1-9. Berlin: Springer-Verlag. Börner, Katy. 2002. "Twin Worlds: Augmenting, Evaluating, and Studying Three-Dimensional Digital Cities and Their Evolving Communities". In Digital Cities II: Computational and Sociological Approaches, Lecture Notes in Computer Science 2362, edited by Tanabe, Makoto, Peter van den Besselaar, and Toru Ishida, 256-269. Berlin: Springer-Verlag. Börner, Katy. 2002. "Visual Interfaces for Semantic Information Retrieval and Browsing". In Visualizing the Semantic Web: XML-based Internet and Information Visualization, edited by Geroimenko, Vladimir, and Chaomei Chen, Ch. 7, 99-115. London: Springer-Verlag. Chen, Chaomei, and Katy Börner. 2002. "Top Ten Problems in Visual Interfaces of Digital Libraries". In Lecture Notes in Computer Science: Visual Interfaces to Digital Libraries, edited by Chen, Chaomei, and Katy Börner, 226-231. Berlin: Springer-Verlag. Rasmussen, E., H. B. Atkins, and Katy Börner. 2002. "Visualizing Knowledge Domains". Proceedings of the ASIST Annual Meeting, Philadelphia, PA 476-477. Feng, Ying, and Katy Börner. 2002. "Using Semantic Treemaps to Categorize and Visualize Bookmark Files". SPIE Conference on Visualization and Data Analysis, San Jose, CA 4665: 218-227. Börner, Katy, Ying Feng, and Tamara Misenor McMahon. 2002. "Collaborative Visual Interfaces to Digital Libraries". Second ACM+IEEE Joint Conference on Digital Libraries, Portland, OR 279-280. Börner, Katy, William Richard Hazlewood, and Sy-Miaw Lin. 2002. "Visualizing the Spatial and Temporal Distribution of User Interaction Data Collected in Three-Dimensional Virtual Worlds". Sixth International Conference on Information Visualization, London, UK 25-31. Börner, Katy, and Chaomei Chen. 2002. "Visual Interfaces to Digital Libraries". JCDL Workshop: Visual Interfaces to Digital Libraries. In Second ACM+IEEE Joint Conference on Digital Libraries, Portland, OR 425. Baumgartner, Jason, and Katy Börner. 2002. "Towards an XML Toolkit for a Software Repository Supporting Information Visualization Education. Interactive Poster". IEEE Information Visualization Conference, Boston, MA. Paolillo, John, and David Heald. 2002. "Democratic Participation in the Discursive Management of Usenet". 35th Hawaii International Conference on System Sciences, Big Island, HI 1040-1049. Baumgartner, Jason, and Tim Waugh. 2002. "Roget2000: A 2D Hyperbolic Tree Visualization of Roget's Thesaurus". SPIE Conference on Visualization and Data Analysis, San Jose, CA 339-346. Börner, Katy, and Chaomei Chen, eds. 2002. Lecture Notes in Computer Science: Visual Interfaces to Digital Libraries. Springer-Verlag. Hook, Peter A. 2002. "Creating an Online Tutorial and Pathfinder". Law Library Journal 94 (2): 243-265. Zhang, Junliang, Javed Mostafa, and Himansu Tripathy. 2002. "Information Retrieval by Semantic Analysis and Visualization of the Concept Space of D-Lib Magazine". D-Lib Magazine 8 (10). Börner, Katy, and Chaomei Chen. 2002. "Workshop Report: Visual Interfaces to Digital Libraries at JCDL '02". ACM/SIGIR Forum (2). Börner, Katy, Margaret Corbit, and Bonnie Jean DeVarco. 2002. "Building Blocks for Virtual Worlds". CILT Seed Grant Interim Report. Börner, Katy, and Chaomei Chen. 2002. "Workshop Report: Visual Interfaces to Digital Libraries at JCDL '02". D-Lib Magazine, July/August 8 (10). Börner, Katy. 2001. "Twin Worlds: Visualization of User Interaction Data to Study Adaptive, 3-Dimensional, Collaborative Spaces and Their Communities". Workshop on Empirical Evaluations of Adaptive Systems, 8th International Conference on User Modeling. Sonthofen, Germany 33-40. Börner, Katy, and Chaomei Chen. 2001. "JCDL Workshop: Visual Interfaces to Digital Libraries - Its Past, Present, and Future". Proceedings of the First ACM-IEEE Joint Conference on Digital Libraries, Roanoke, VA 482. Börner, Katy. 2001. "iScape: A Collaborative Memory Palace for Digital Library Search Results". Proceedings of the International Conference on Human-Computer Interaction, New Orleans, LA 1: 1160-1164. Mongin, Larry, Javed Mostafa, and John Fieber. 2001. "Using a Spring Embedding Algorithm to Display Term Relationships from a Medical Concept Discovery System". Poster at the Annual Conference of the American Medical Informatics Association, Washington, D.C. 661-662. Börner, Katy, and Yuezheng Zhou. 2001. "A Software Repository for Education and Research in Information Visualization". Information Visualisation Conference, London, UK 257-262. Börner, Katy. 2001. "Adaptation and Evaluation of 3-Dimensional Collaborative Information Visualizations". 8th International Conference on User Modeling, Bavaria, Germany 33-40. Börner, Katy, and Yu-Chen (Alan) Lin. 2001. "Visualizing Chat Log Data Collected in 3-D Virtual Worlds". Information Visualisation Conference, London, UK 141-146. Börner, Katy. 2001. "Efficient Case-Based Structure Generation for Design Support". Artificial Intelligence Review 16 (2): 87-118. Börner, Katy, and Chaomei Chen. 2001. "Visual Interfaces to Digital Libraries - The First International Workshop at the First ACM+IEEE Joint Conference on Digital Libraries". D-Lib Magazine (In-Brief) 7 (7/8). Börner, Katy, and Chaomei Chen. 2001. "Visual Interfaces to Digital Libraries - The First International Workshop at the First ACM+IEEE Joint Conference on Digital Libraries". SIGIR Forum 35 (1). Börner, Katy. 2001. "Using Active Worlds Technology to Build an iUniverse of 3-D Collaborative Learning Environments". Learning Technology Newsletter 6-9. Börner, Katy, Andrew Dillon, and Margaret Dolinsky. 2000. "LVis - Digital Library Visualizer". Information Visualization 2000, Symposium on Digital Libraries, London, UK 77-81. Börner, Katy. 2000. "Searching for the Perfect Match: A Comparison of Free Sorting Results for Images by Human Subjects and by Latent Semantic Analysis Techniques". Information Visualisation 2000, Symposium on Digital Libraries, London, UK 192-197. Börner, Katy. 2000. "Visible Threads: A Smart VR Interface to Digital Libraries". Proceedings of SPIE 2000: Visual Data Exploration and Analysis, San Jose, CA 228-237. Börner, Katy. 2000. "Extracting and Visualizing Semantic Structures in Retrieval Results for Browsing". ACM Digital Library Conference, San Antonio, TX 234-235. Börner, Katy. 2000. "VegoWelt: A Smart Virtual Playroom". International Journal of Design Computing 2. Börner, Katy, Sven Bertel, Mitja Hmeljak, Matt Jadud, and Bob Najlis. 2000. "VegoWelt: The Video". Börner, Katy. 1999. "Welcome to VegoWelt". Ylem Newsletter: Facing Reality 19 (8): 12. Börner, Katy, Rainer Fehr, and Ipke Wachsmuth. 1998. "AkuVis: Interactive Visualization of Acoustic Data. Computer Science for Environmental Protection'98: Networked Structures". In Information Technology, the Environment and Business, edited by Haasis, H. D., and K. C. Ranze, 722-728. Marburg: Metropolis-Verlag. Börner, Katy. 1998. "CBR for Design". In Case Based Reasoning Technology: From Foundations to Applications, Lecture Notes in Computer Science, edited by Bartsch-Sprl, B., S. Wess, Hans-Dieter Burkhard, and Martin Lenz, Ch. 8, 201-234. Berlin: Springer-Verlag. Börner, Katy. 1998. "Concept-Based, Adaptive Human-Computer Interaction". Proceedings of the 9th Irish Conference on Artificial Intelligence and Cognitive Science, Dublin, Ireland 103-109. Börner, Katy. 1998. "Generative, Adaptive Human-Computer Interaction by Conceptual Analogy". Combining AI and Graphics for the Interface of the Future, held in conjunction with the 13th Conference on Artificial Intelligence, Brighton, UK 98-109. Börner, Katy, Rainer Fehr, and Ipke Wachsmuth. 1998. "Audio-Visual Interaction with Noise Pollution Data". Virtual Environments Conference, Stuttgart, Germany 19_1-19_4. Börner, Katy, and Constanze Vorwerg. 1998. "Applying VR Technology to the Study of Spatial Perception and Cognition". Mind III: The Annual Conference of the Cognitive Science Society of Ireland, Theme: Spatial Cognition, University College, Dublin, Ireland 1/3: 128-134. Börner, Katy, and Ipke Wachsmuth. 1998. "AkuVis: Exploring Visual Noise". 7th International Conference on Human Computer Interaction. Börner, Katy. 1997. "Konzeptbildende Analogie: Integration von Conceptual Clustering und Analogem Schliessen zur Effizienten Unterstuetzung von Entwurfsaufgaben". In Dissertation. Berlin: Infix Verlag. Börner, Katy, Eberhard Pippig, Carl-Helmut Coulon, and Elisabeth-Ch Tammer. 1996. "Structural Similarity and Adaptation". In Advances in Case-Based Reasoning. Proceedings of the Third European Workshop on Case-Based Reasoning (EWCBR-93), edited by Smith, Ian, and B. Faltings, 58-75. Berlin: Springer-Verlag. Börner, Katy, and Eberhard Pippig. 1996. "Konzeptbildende Analogie: Conceptual Clustering fr effizientes analoges Schlieen im Entwurf". Leipziger Informatik-Tage 1996 175-180. Börner, Katy, Roland Fassauer, and Heiko Wode. 1996. "Conceptual Analogy: Conceptual Clustering for Informed and Efficient Analogical Reasoning". 4th German Workshop on Case-Based Reasoning (System Development and Evaluation) 78-86. Börner, Katy. 1995. "Conceptual Analogy". AAAI 1995 Fall Symposium Series: Adaptation of Knowledge for Reuse, Boston, MA, November 10-12 5-11. Börner, Katy, and Dietmar Janetzko. 1995. "System Architecture for Computer-Aided Building Engineering". Proceedings of the 6th International Conference on Computing in Civil and Building Engineering 385-390. Börner, Katy. 1995. "Interactive, Adaptive, Computer-Aided Design". International Conference CAAD Futures, Singapore, September 24-26 627-634. Börner, Katy. 1995. "Modules for Design Support". FABEL-Report 35. Börner, Katy. 1994. "Structural Similarity as Guidance in Case-Based Design". In Topics in Case-Based Reasoning - Selected Papers from the First European Workshop on Topics in Case-Based Reasoning, Lecture Notes in Artificial Intelligence, edited by Wess, S., K. D. Althoff, and Michael Richter, 197-208. Berlin: Springer-Verlag. Börner, Katy, and Dietmar Janetzko. 1994. "Case-Based Learning for Design". Proceedings of the 2nd European Workshop on Case-Based Reasoning, Chantilly, France 273-281. Jschke, Oliver, Dietmar Janetzko, and Katy Börner. 1994. "Learning and Applying Conditions for Testing Realizations of Design-Tasks". Proceedings of the 7th Annual Meeting of the German Group for Machine Learning. Janetzko, Dietmar, Katy Börner, Oliver Jschke, and Gerhard Strube. 1994. "Task-Oriented Knowledge Acquisition and Reasoning for Design Support Systems". Proceedings of the European Conference on Cognitive Science in Industry, Luxembourg 153-184. Börner, Katy. 1994. "Towards Formalizations in Case-Based Reasoning for Synthesis". Papers from the AAAI Workshop,Seattle, Washington, Technical Report WS-94-01 177-181. Börner, Katy, and Dietmar Janetzko. 1994. "Case-Based Learning for Knowledge-Based Design Support". ECAI Workshop Integration of Machine Learning and Knowledge Acquisition, Amsterdam, The Netherlands. Voss, Angi, Carl-Helmut Coulon, Wolfgang Günther, Bernd Linowski, Jrg Schaaf, B. Bartsch-Sprl, Katy Börner, Elisabeth-Ch Tammer, Helge Drschke, and Markus Knauff. 1994. "Retrieval of Similar Layouts - About a Very Hybrid Approach in FABEL". AI in Design 1994 625-640. Börner, Katy, and Angi Voss. 1994. "Applying Machine Learning to Improve Innovative Design Support Systems". AID Workshop Machine Learning in Design, Lausanne, Switzerland. Janetzko, Dietmar, Katy Börner, Carl-Helmut Coulon, and Ludger Hovestadt. 1993. "Towards a Task-Oriented Methodology in Knowledge Acquisition and System Design in CBR". Proceedings of the First European Workshop on Case-Based Reasoning 2: 360-365. Börner, Katy. 1993. "Structural Similarity in Case-Based Design". Flle in hybriden Systemen. Beiträge zum 2. Workshop des Arbeitskreises fallbasiertes Schließen 1-13. Börner, Katy, Klaus P. Jantke, Siegfried Schönherr, and Elisabeth-Ch Tammer. 1993. "Lernszenarien im fallbasierten Schlißen". FABEL-Report 14. Janetzko, Dietmar, and Katy Börner. 1993. "Tasks-Methods-Knowledge Interdependencies in CBR-Systems". FABEL-Report 9. Börner, Katy. 1993. "Term-Based Approach to Structural Similarity as Guidance for Adaptation". Similarity Concepts and Retrieval Methods, FABEL-Report 13. Börner, Katy. 1992. "Komplexitätsreduktion von Konstruktionsaufgaben". Workshop Kontrolle von Problemlöseverfahren, German Workshop on Artificial Intelligence. Börner, Katy. 1992. "Ein allgemeines Modell zur Speicherung episodischen Wissens und separat lernbare Ähnlichkeitsmaße". Workshop Ähnlichkeit von Fällen beim fallbasierten Schließen. SEKI-Report, Universität Kaiserslautern. Börner, Katy. 1992. "Verfahren zur punktualen Ermittlung der spektralen Remissionsfunktion mittels eines optoelektronischen Farbmeßkopfes. DE 4120749 A1". Date of filing: 24.06.1991. Date of publication of application: 20.02.1992. Börner, Katy. 1992. "Verfahren zur meßtechnischen Erfassung des punktualen Anstieges von Remissions-, Reflexions- und Transmissionsspektren mittels nur einer LED. DE 4126678 A1". Date of filing: 13.08.1991. Date of publication of application: 13.03.1992.